Hartsfield-Jackson Atlanta International Airport (ATL) is a large and extremely busy airport. In fact, ATL is the busiest airport in the world, transporting over 100 million passengers a year. Considering the airport’s size, the straightforward and functional layout is easy to navigate, especially if you’ve done your research before your visit. Below, you’ll find all the details you need to get between terminals, the locations of each concourse, and what to do when you have a connecting flight. Hartsfield-Jackson Atlanta International Airport Map. Image courtesy of atl.com. ATL has 2 terminals: the Domestic Terminal (or Main Terminal) and the International Terminal. There are also 7 concourses that are airside areas with additional shops and restaurants, and are where the gates are located for flight departures. You’ll see from the map above that the airport is laid out a bit like a fish bone, with the Domestic Terminal as the head, the International Terminal as the tail, and the concourses as the ribs. The spine is an underground transportation system connecting everything together. If you’re flying from the International Terminal, you can pass through security in the Domestic Terminal, and vice versa, providing you hold a valid boarding pass. If you’re flying with checked luggage then you would need to check whether your airline has check-in facilities at the terminal of your choice, or if you’re flying with carry-on baggage only, then you would need to have checked-in online and have a printed or mobile boarding card. You have several options for traveling between the terminals and concourses. You can travel between the Domestic and International Terminals (without passing through security) by taking the airport shuttle service. If arriving from the MARTA station or from other entry points on the western side of the Domestic Terminal, you need to enter through the W2 door into the South Terminal baggage claim area. From here, you can follow signs to Ground Transportation where you can pick up the shuttle bus to go to the International Terminal. From the International Terminal, you can pick up the shuttle bus from the northern area of the terminal through doors A1, A2, or A3. The shuttle journey between terminals takes around 12 minutes. Plane Train. Image courtesy of atl.com. The Plane Train, located on Level 0, is one of the easiest ways to get around ATL, operating 24 hours a day and departing every 2 minutes. Take an escalator or elevator down to the lower level where the Plane Train will be signposted. Running on a 3-mile loop, the Plane Train runs between the Domestic Terminal (baggage reclaim) and Concourse F (International Terminal) stopping at Concourses T, A, B, C, D, and E along the way. A countdown timer alerts passengers to the next Plane Train arrival and there are automatic announcements and maps onboard to help you plan your route. Escalators and elevators are accessible from each stop, and there is little or no gap between the train and platform. If you require any wheelchair assistance, you can let airport staff know at security and someone will assist you. You also have the option of walking along the Transportation Mall that is on the same level as the Plane Train (Level 0). There are moving walkways along the way and some interesting art and history exhibits along the way. The airport signs indicate that it’s a 5-minute walk between concourses (apart from E-F, which is 10 minutes) so keep that in mind if you’re in a rush. For example, walking from Concourse A to F will take around 35 minutes, whereas the Plane Train will take just a few minutes and departs every 2 minutes. Once you have arrived at your departing concourse, you will need to take the escalator or elevator up to departures (Level 2) where you can walk to your gate. There are no moving walkways along the individual concourses so electronic carts are available to aid passengers with any mobility issues. Hartsfield-Jackson Atlanta International Airport Domestic Terminal. Image courtesy of atl.com. The Domestic Terminal is located on the western side of the airport and is further separated into north and south by an atrium. Delta Air Lines occupies the South Terminal with its own baggage claim area and curbside check-in. Other domestic airlines, like Southwest Airlines, United Airlines, Spirit Airlines, Alaska Airlines, and JetBlue Airways, operate from the North Terminal with a baggage claim area and check-in facilities. United has a dedicated baggage claim area located on ground level that is accessible via a number of escalators and elevators. The MARTA train station is located in the Domestic Terminal, so if you were arriving or departing from the Domestic Terminal but flying from the International Terminal, you would need to make use of the ground transportation options covered earlier. The atrium area has a range of shops, restaurants, and different airport services, with more shops and restaurants once you pass through security into the concourses. There are 3 security checkpoints in the Domestic Terminal: the main checkpoint, which is the largest, the north checkpoint, and south checkpoint. Once you’ve cleared security, you’ll arrive at Concourse T.
Gates are marked according to their concourse, for example, T14 is in Concourse T. All concourses, apart from Concourse T, have gates on either side with odd numbered gates on the eastern side and even numbered gates on the western side. Each concourse is about half a mile in length with the entry point in the middle, so you would need to allow around 5 minutes to walk to the furthest gate from the halfway entry point. Hartsfield-Jackson Atlanta International Airport Concourse T. Image courtesy of atl.com. Concourse T is a part of the Domestic Terminal building and serves gates T1 through T15. Delta, WestJet Airlines, United, and other carriers operate from this concourse. When passing through security from the Domestic Terminal, you will arrive directly into the concourse, where depending on your gate number, you’ll need to head right or left. Gates T1 through T8 are to the right and gates T9 through T17 to the left. Hartsfield-Jackson Atlanta International Airport Concourse A. Image courtesy of atl.com. Concourse A is made up of 34 gates many of which are operated by Delta. There is a Delta Ticket Service Center located opposite of gate A18, a Delta Self-Service Center at gate A27, and a Delta Sky Club lounge near gate A17. If arriving from the Domestic Terminal, then gates A1 through A18 are to the right, and A19 through A34 are to the left. Hartsfield-Jackson Atlanta International Airport Concourse B. Image courtesy of atl.com. Concourse B has 35 physical gates but the 35th gate is actually labeled as B36. This may be to remain consistent with ATL’s odd and even numbering dictating which side of the concourse the gate is on. If arriving from the Domestic Terminal then gates B1 through B18 are to the right and gates B19 through B36 are to the left. As with Concourse A, Delta dominates this concourse but other airlines do operate from here as well. There’s a Delta Ticket Service Center and Delta Self-Service Center located near gate B9, and a Delta Sky Club lounge in the central area. Hartsfield-Jackson Atlanta International Airport Concourse C. Image courtesy of atl.com. Concourse C has 47 physical gates but the gates are numbered C1-C22, C30-C53, and C55. If you approach Concourse C from the Domestic Terminal, then gates C1 through C22 would be to the right, and gates C30 through C53 and gate C55 to the left. 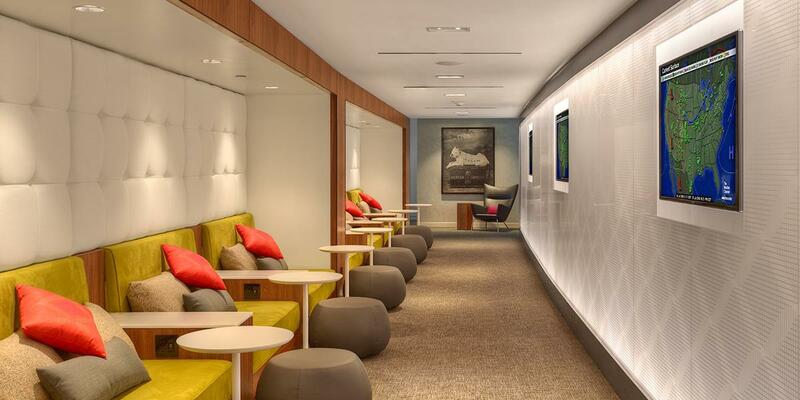 There is a Delta Connection Ticket Service Center located at gate C40, and a Delta Sky Club lounge at gate C37. Hartsfield-Jackson Atlanta International Airport Concourse D. Image courtesy of atl.com. Concourse D has 41 physical gates. If arriving from the Domestic Terminal, then gates D1 through D16, including D1A, D8A, and D11A, are located to the right and gates D21 through D35, gates D38 through D42, D44, and D46 are located to the left. 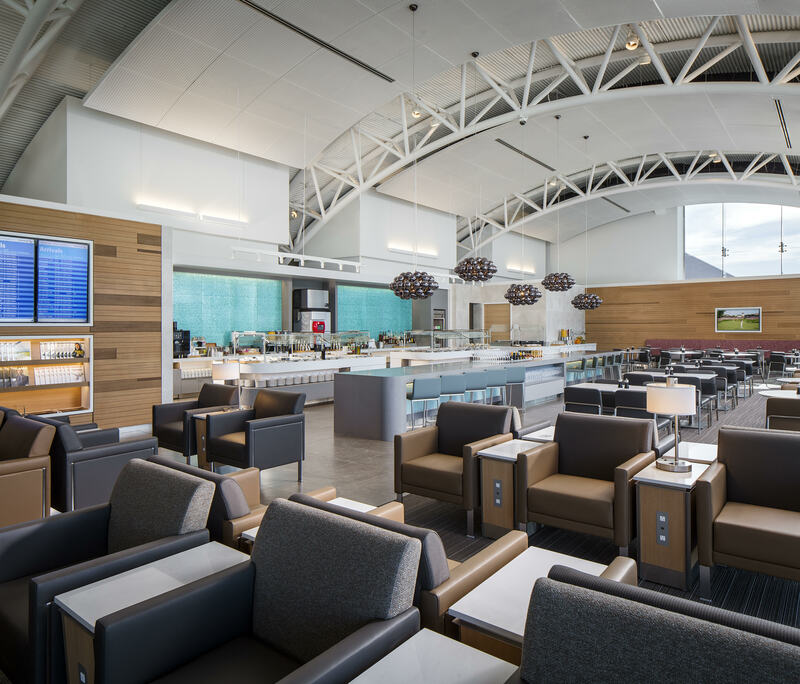 The concourse has a United Club lounge located near gate D12, and a Delta Sky Club lounge is located near gate D27. The International Terminal is located on the eastern side of the airport with most international flights operating from Concourses E and F. Departures are on Level 2 where check-in desks are available for airlines such as Delta, Virgin Atlantic, Lufthansa, and British Airways. Level 2 is also where passengers pass through security to go, airside, into Concourse F. From here, you can take the escalator or elevator to Level 0 and ride the Plane Train or walk through a pedestrian walkway to Concourse E. You’re also able to Plane Train or walk to any of the other concourses for the Domestic Terminal. The time it takes to walk from Concourse F to E is around 10 minutes. Arrivals are on Level U with baggage claim and ground transportation services for taxis, rental cars, and hotel/park-ride shuttles. This is also where the shuttle departs for the Domestic Terminal. 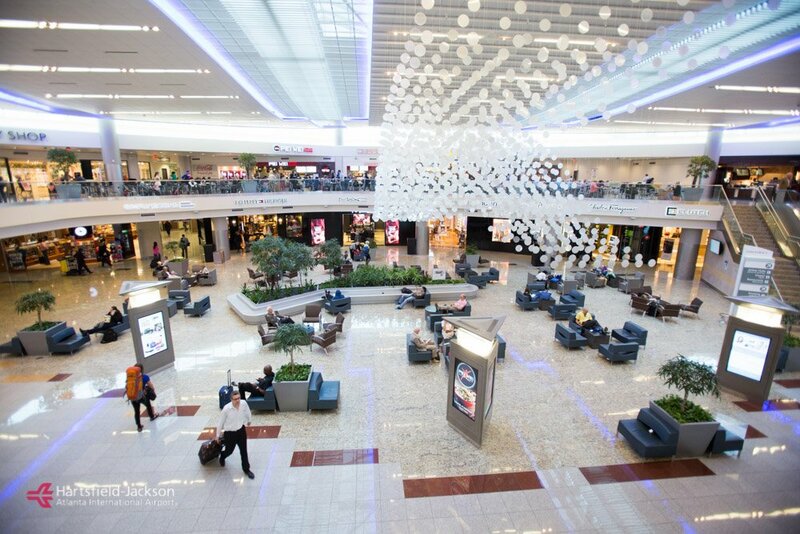 The Level 3 Mezzanine is home to the Club at ATL, and Delta Sky Club lounges along with a few shops, and restaurants. Hartsfield-Jackson Atlanta International Airport Concourse E. Image courtesy of atl.com. Concourse E consists of 28 gates numbered E1 through E12, E14 through E18, and E26 through E36. To reach Concourse E from the International Terminal, passengers must pass through security into Concourse F where you can then ride the Plane Train or walk on Level U to Concourse E.
If you arrive from the pedestrian walkway on the east side of Concourse E, you’ll have gates E18, E16, and E14 on the right side of the concourse, and gates E17 and E15 on the left. For all other gates, you’ll need to walk through the concourse until you reach a cross-section where gates E1 through E12 are to the left and E26 through E36 are to the right. If arriving from the Plane Train on the west side of Concourse E, you’ll walk into the cross-section where gates E1 through E12 are to the right, and gates E26 through E36 are to the left. For gates E14 through E18, you’ll need to continue straight across the cross-section. Concourse E has a Delta Sky Club lounge opposite of gate E14 and Delta Ticket Counter at the cross-section. Hartsfield-Jackson Atlanta International Airport Concourse F. Image courtesy of atl.com. Concourse F is airside of the International Terminal. For departing passengers, once you have passed through security, you’ll arrive into the Transition Hall of Concourse F where you can take an elevator or escalator to Level U for onward travel to other concourses. Concourse F consists of 12 gates numbered F1 through F10, F12, and F14. If passing through the International Terminal security checkpoint, then gates F1 through F10 are to the left, and gates F12 and F14 to the right. Concourse F is about half the length of the other concourses, measuring about a quarter of a mile, so once you arrive airside from security, it should only take a few minutes to walk to your departure gate. On the arrivals level, passengers will pass through Passport Control before arriving into the baggage claim area within the International Terminal. Hartsfield-Jackson International Airport Concourse F. Image courtesy of www.atl.com. ATL’s relatively straightforward layout makes flight connections fairly easy. Regardless of where you are traveling to or from, all passengers must pass through Passport Control upon arrival at ATL, and this will be processed within the concourse that you arrive at. All passengers also have to proceed to the baggage claim area to pass through customs. There will be signs for connecting-flight passengers that will lead to a baggage check room to drop off your bag for the next leg of your journey, providing your luggage has been tagged for your final destination. For any passengers that have booked an onward flight independently, unless the carrier has a check-in desk at the International Terminal, then you would need to take the shuttle bus to the Domestic Terminal to check-in for your next flight. Domestic to domestic, or domestic to international connecting passengers do not have to clear security again. However, any international to domestic or international to international connecting passengers will need to clear security again. Once you pass security, you can take the Plane Train or the pedestrian walkway to your departure gate. Both terminals and all 7 concourses are accessible to passengers with mobility concerns, disabilities, and wheelchair users. There are multiple elevators to connect to the different levels, including Level 0 to access the underground tunnels, and the Plane Train that is also accessible for wheelchair users. Overall, ATL’s functional layout and clear signage mean it’s a relatively easy airport to navigate. As long as you’re aware of which terminal you’re departing from, or that you have the ability to pass through the alternative terminal, navigating ATL can be a breeze. Even if you find yourself at the wrong end of the airport, the free shuttle bus can get you where you need to go in a reasonable 12 minutes. As ATL serves so many passengers, allow plenty of time to clear security, and to arrive at your departure gate. Although you may try to get ahead start by researching what gate number past flights have arrived at, these gates are always subject to change. Leave plenty of time to catch the Plane Train or walk through the Pedestrian Mall while admiring some of the cool and quirky art exhibits.